Lineart scans: Multiply or overprint? | Colecandoo! Lineart scans: Multiply or overprint? While i’m not sure about the behind-the-scenes technical differences between the two, but it would appear that there is a feature of multiply on lineart images which isn’t so great once a PDF is flattened. Using the following demonstration, i’ve placed the same two images side by side – one greyscale, one lineart, then one applied with multiply and then one applied with overprint. 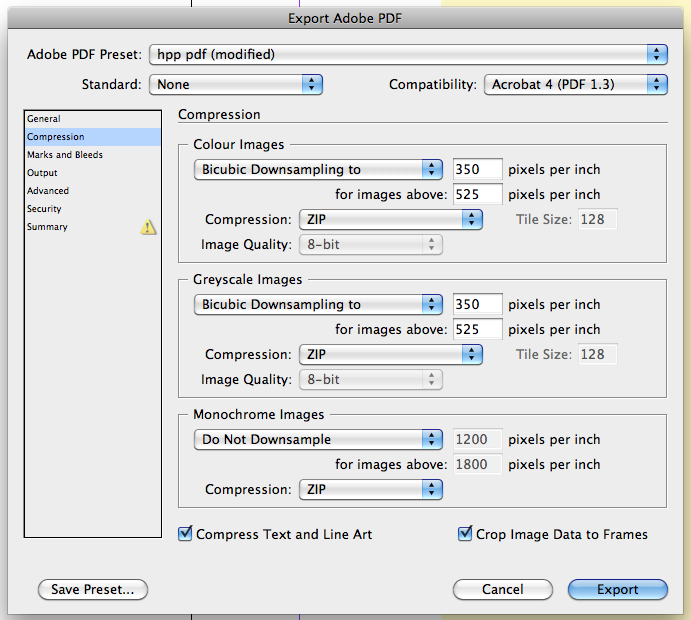 From here, i’ve exported to PDF with two major considerations: using Acrobat 4 compatibility and downsampling CMYK and greyscale images. Now, once the PDF is analysed using a third party plug-in Enfocus Pitstop, I can see things which Acrobat Professional would not normally tell me. In this instance, the greyscale images have been unaffected and essentially appear the same. However, the lineart image which had the multiply effect on it has dropped in resolution from 1200 DPI to 350 DPI; and it has gone from being a lineart image (1 bit per channel) to being a greyscale image (8 bits per channel). So multiply has effectively flattened the lineart as a greyscale and compressed it based upon the compression settings for greyscale images. The lineart image set to overprint on the right is unchanged – it is still 1-bit at 1200 DPI. What this means is that sharp, crisp lineart which has had a multiply effect applied to it (presumably to behave as an overprint) can render as not so sharp greyscales. This also means that rather than outputting as lineart, the image will be rendered as halftone dots. 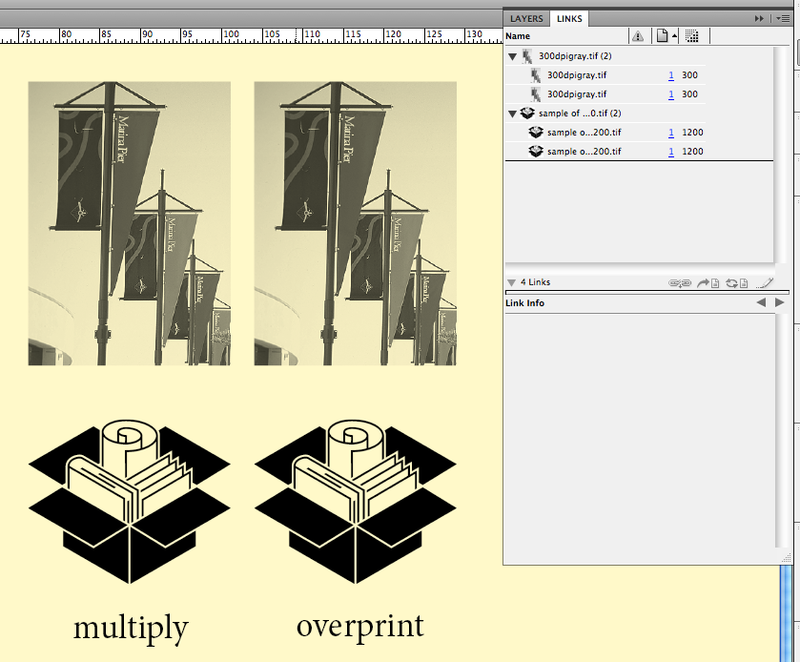 If linearts have to appear as if they are overprinting, use the overprint function from the attributes panel. 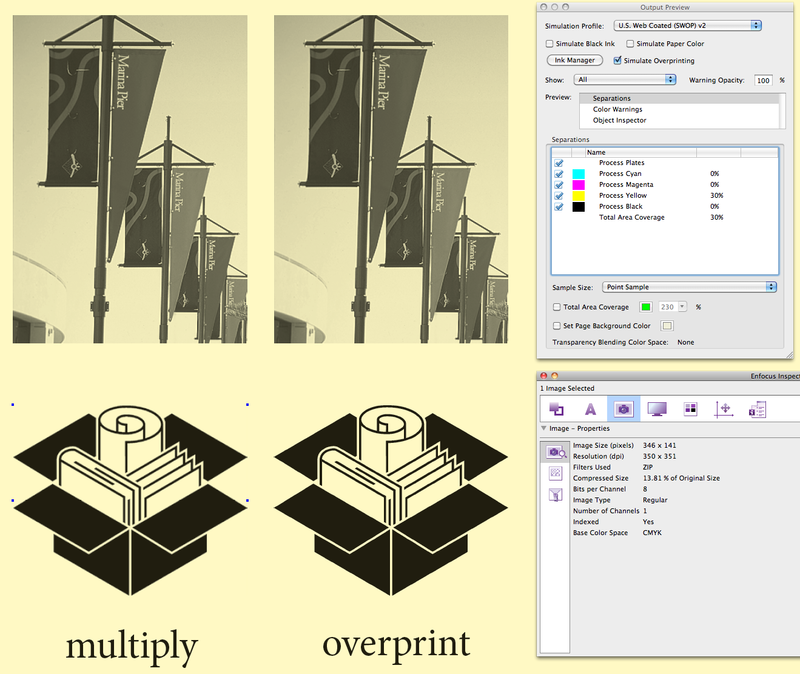 Further to this, if a PDF is made using higher Acrobat compatibility settings and no downsampling is applied, it may appear that the PDF is fine in Enfocus Pitstop, but to print a PDF to final output it must ultimately be flattened at the RIP and the same thing will happen as in the example above. One Response to Lineart scans: Multiply or overprint?